Are you a faux flower lover or hater? OK so here's the thing - I've always thought (and I'm sure many of you will agree) that fake flowers haven't exactly had the best reputation for style and elegance, the words naff and tacky easily spring to mind BUT I'm here to tell you that with the whole botanical trend going on in interiors right now, faux flowers are really on the up and are reaching new heights of amazingness; they have come so far in terms of quality, I promise you really wont be able to tell that the new generation of fakes aren't real! I have a faux Lavender plant in my hallway which is fantastic, mainly because I no longer have to keep rushing out to buy fresh flowers to keep up appearances. It has certainly saved a lot of effort and off the success of it I'm now thinking about investing in some cool faux flowers for the bedroom. "GO LOW MAINTENANCE WITH FAUX FLOWERS AND CONSIDER THEIR AMAZING LIFE SPAN"
OK so you're starting to like the idea of faux flowers but how much will a bunch set you back? - well if you buy the best quality (recommended) then an average bunch may cost as much as £120 BUT considering they will last years, it's clearly a cost effective route to go down in the long run. Although I will always have fresh flowers in my home, I think going partly faux in those key areas is a great way to save money and precious time. Having said that you can also find the odd (and I mean odd) cheap and cheerful fauxs on the odd occasion on the high street. Take those little mini planters at the top of the post - £2 each from Primark!! Who offers the best quality? I popped along to the Spring Fair at the NEC this week - one of the biggest home and gift trade shows in Europe. The highlight for me was chatting to world renowned Interior Designer and Stylist Abigail Ahern. Abigail's key look is all about going dark with smoky, inky tones as an interior backdrop, layering colour and texture on top which pops beautifully. In addition to this her look is very much supported by an abundance of faux flowers - and trust me they are the best quality! 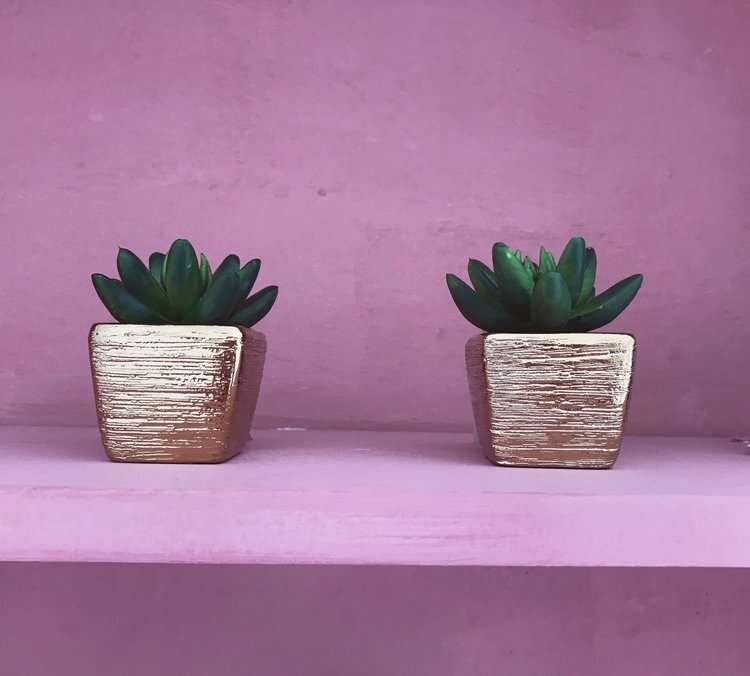 Abigail's show stand was typically awash with raw natural surfaces, deep hughes and lots of amazing faux flowers, leafy greens and cacti - a look which she has really zoned in on and forms a huge part of her brand. It's a brave but winning look. Have a look at these shots below. CLICK ON THE FLOWERS ABOVE TO SHOP HER RANGE. Neptune Home also have an amazing selection of faux flowers which after having also seen in the flesh, can confirm the quality is superb - you literally can't tell they are fake. I popped along to one of my local Neptune stockists, Holloways and had a good look through the collection. Check out these examples below. CLICK ON THE FLOWERS ABOVE TO SHOP NEPTUNE'S RANGE. Also seen at other trend setting trade fairs around the world, the hanging faux flower look is set to be pretty huge. It's all about experimenting and going a bit wacky with your flower arrangements, an example showcased beautifully here at the Maison & Object show in Paris this year by TEAM LAB with moving flowers suspended from the ceiling - how amazing is this!! 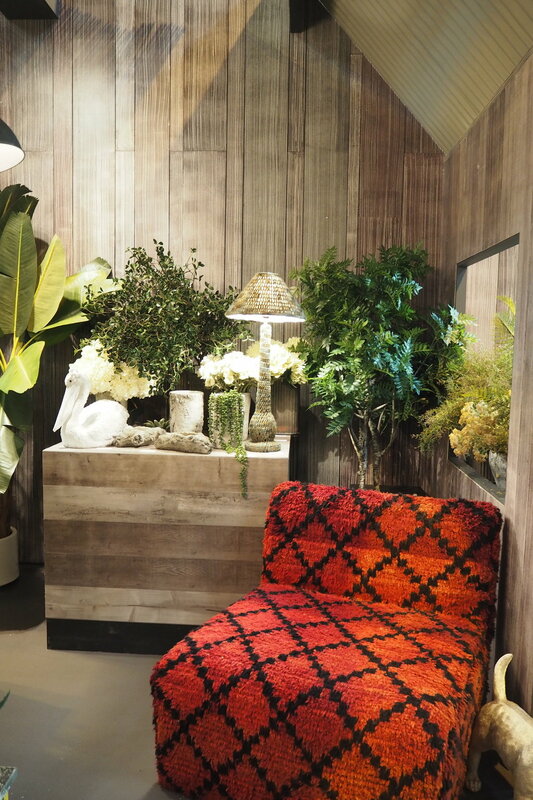 And this below spotted at the NEC trade show, faux ferns intermingled with a chandelier which looks kind of fun! 1. Start off with an all-rounder faux plant - The Lavender plant I mentioned earlier is a great starting point and works really well throughout the year. You can get a nice one from OKA here. 2. Buy the best quality - You really get what you pay for. Buy cheap and the flowers just wont have the same detail and quality and will look utterly rubbish. 3. Mix in with real greens - if you want to bring the budget down, just buy 2 or 3 stems and add foliage from the garden, inter-change as and when. 4. Go for single stem statements - this is a great way to add impact but keep it simple, and inexpensive. Invest in a big vase which would look great in the corner of a room with a big single stem. 5. Keep it seasonal - A lot more convincing and it's nice to have a change every so often; why not change your flowers at the same time as changing your wardrobe each season. So are you a faux flower fan or a faux flower newbie, either way I would love to hear from you!